The circus sweetie rainbow clown tight highs are a great finishing touch to almost any female clown costume. Their pastel color palette doesn't stand out as brightly as other rainbow thigh highs to look like they are a part of the costume. 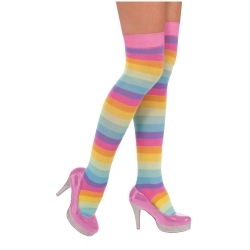 The circus sweetie rainbow clown tight highs are colored as pictured and include one pair of thigh highs. Thigh highs are one size fits most up to 160 lbs.